Wy & Associates is a licensed Company Auditor based in Kuala Terengganu, Terengganu. Contact them to find out more of range of financial services that they provide. 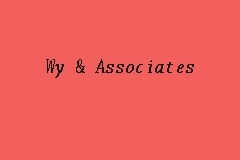 Wy & Associates is a licensed auditor in Malaysia that also provide accounting service and tax consultation. Wy & Associates is a member of the professional body Malaysian Institute of Accounts (MIA).